Picture taken in sunlight. Oddly, the formula was not thin, but it was rather sheer. It was actually pretty easy to control, but it was streaky. I needed four coats, plus touchups, to reach a sufficient level of opacity. It’s a thick-looking mani, but it’s worth it. 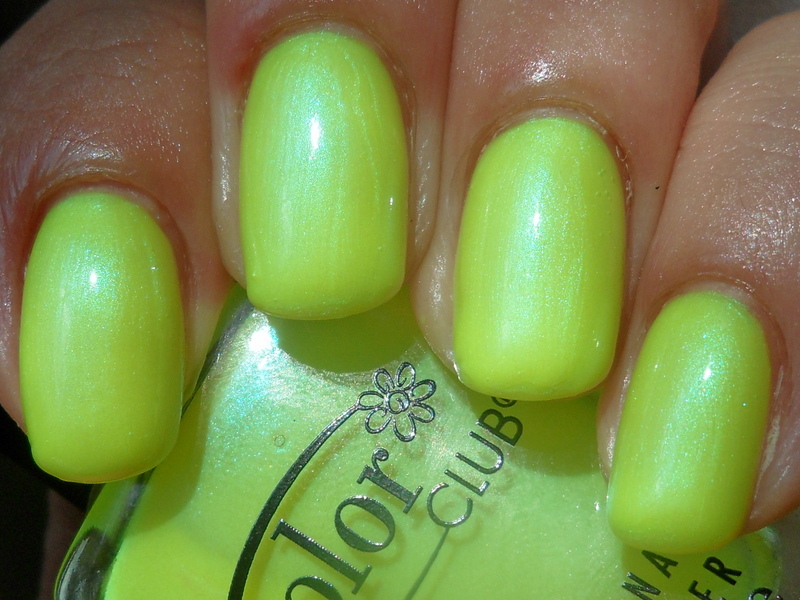 I absolutely love neon highlighter yellow, and this is the first I’ve tried that’s a shimmer. The green flash adds an alienlike glow to an already retina-searing type of color. Admittedly, because of the number of coats I had to do, I probably wouldn’t have wanted this if it wasn’t a scented polish. It smells awesome! It’s a sweet, lemony scent. I love lemon-scented toiletries so it’s no surprise that I keep smelling my own nails. Like the Revlon scented polishes, the scent is strong enough to permeate through topcoat, but not strong enough that it would clash with perfume. I can only really smell it when I have my hands close to my face. I paired this with Color Club Pucci-licious on my toes.